When the guys went off to Father and Sons Camp last weekend, we girls decided to have an adventure of our own. But instead of camping in some wilderness full of mountain lions and picking bugs out of our teeth, we decided to pack up the granddaughters and head for "Princess Camp" -- in Disneyland. My two granddaughters -- Lyla, 2, and Stephanie, 3 -- already think they're princesses. I don't know where they got the idea. I outgrew my princess costume years ago. But they love to dress up in sparkly tiaras, fluffy gowns and mini heels. I wish I could go back to my princess days when life was magical, costumes abundant and all I had to worry about was finding a prince. Or at least a castle with my name on it. 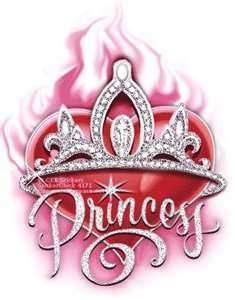 I think most girls play "princess" at some point while growing up. No wonder, since we were raised on stories about Cinderella and Snow White. Some of us never lost the belief that deep down inside, we should be wearing tiaras full-time. I'd loved to have had a fairy godmother who could wave her magic wand and find me that perfect career, financial independence or a charming prince so I could live happily ever after. of men who leave their crap all over my nice clean cottage. I can watch movies like "Tangled," bedazzle my jeans with rhinestones and cover my cell phone case with sequins. I can choose my individual princess "style" and be a fairy tale princess like Cinderella or Snow White, a pop princess like Katy Perry or Lady Gaga or even a mob princess like Victoria Gotti or Snookie. Of course, there are some strings attached to that silk apron. I'd have to learn how to deal with "crown hair." I'd have to see which tiaras best match my pink jeans and T-shirts. And I have to figure out how to use rose petals when bathing, setting the table or making the bed. I suppose I'd need a BLIWF -- Best Lady-in-Waiting Forever. And I'd have to learn how to deal with peasants as well as palace staff, not to mention the king and queen. I'll need the perfect pet as my faithful companion -- maybe a dragon (what do you feed them? ), a mouse (preferably one that talks) or some woodland creatures (except bears -- they scare me). I'll have to memorize the members of my court, because right now I don't know a page from a footman. And then there's all the rigmarole associated with being a princess -- practicing the curtsy and regal wave, conversing with boring heads of state, and preparing meals fit for a king. As for waving a magic wand, it may look easy, but apparently it takes skill, otherwise I could end up turning my husband into pond scum instead of a prince. I don't know. Maybe being a princess is more trouble than it's worth. But as Cinderella once said, "They can't order me to stop dreaming."